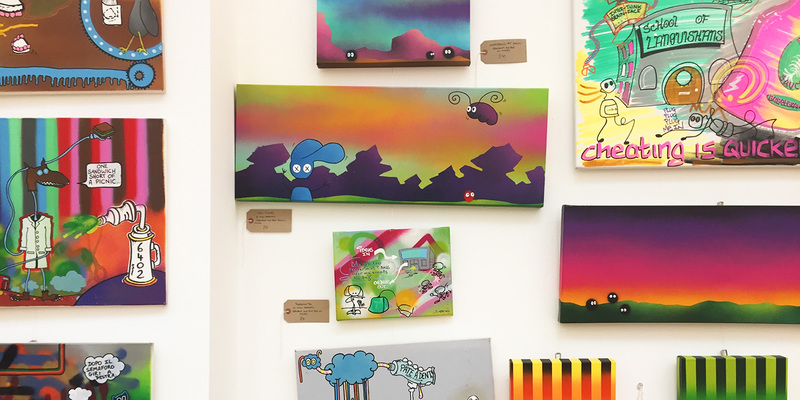 Artists starting out can often struggle finding affordable exhibition space with decent commission rates to allow them to earn their bread and butter. Thankfully, we’re blessed in Croydon with a hugely supportive community, and many an arts space allowing creatives to be seen and heard. One such space is The Clocktower Café’s Click Clock Gallery. 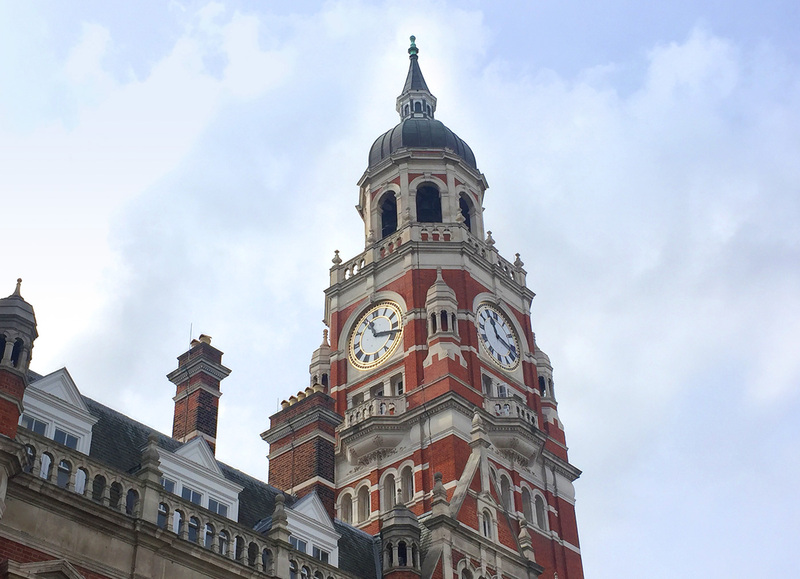 If you don’t already know it, you’ll find the café nestled on the right hand side of Croydon Clocktower’s complex on Katharine Street, between the library and the Spread Eagle pub. 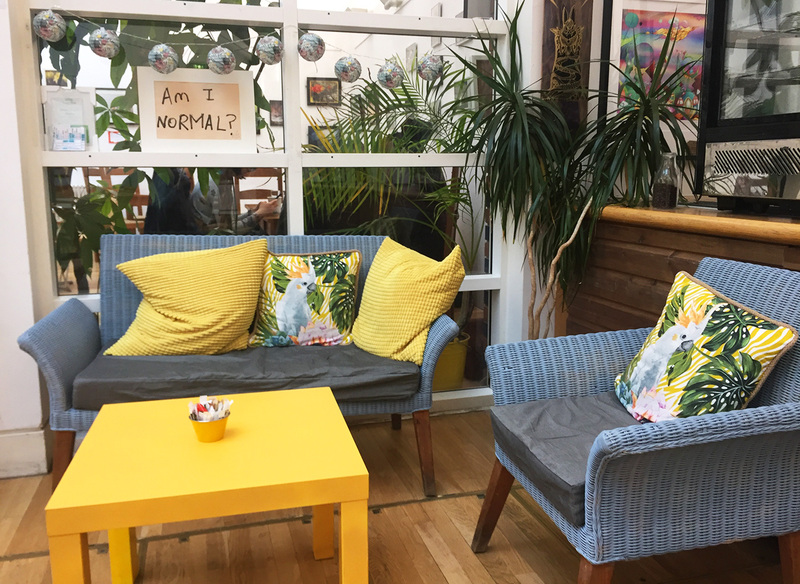 Whether it be lunch with friends or family, or a coffee after visiting the library or pottering about the shops, it’s a great space to have a natter, or just think about life (or even nothing). Its high vaulted ceilings topped with an apex of glass mean it’s got oodles of natural light (great for gazing up at the sky), and therefore the perfect place to double as a gallery. On a Saturday morning a couple of weeks back, I met John Reeve, the man behind the café’s gallery, for a coffee and a chat about how Click Clock came about. Born and bred in Thornton Heath, John, wanted to show kids there were more fulfilling and constructive ways to spend their time. Hence Click Clock Gallery was born, utilising the walls of the Clocktower Café. And the gallery has thrived – in the last five years over 500 artists and photographers have exhibited there. 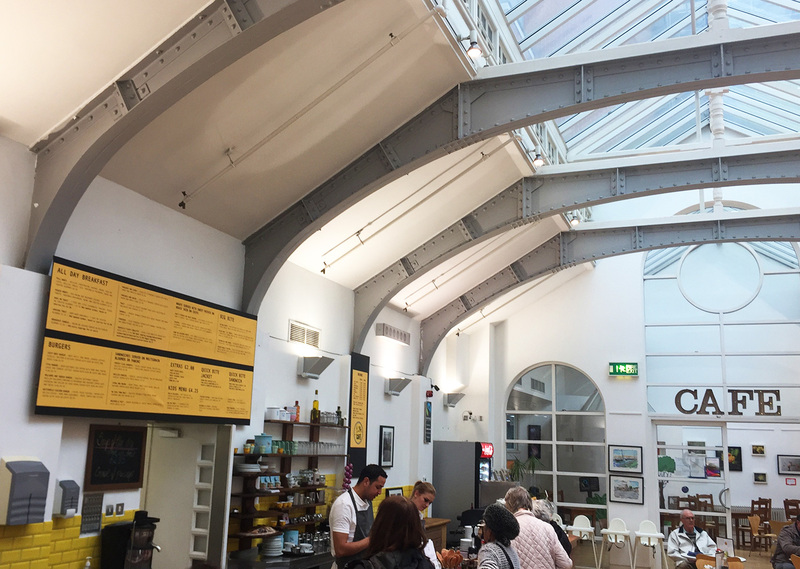 A chartered surveyor by trade, John felt the café was crying out for a dedicated gallery, so living by his surveying mantra: ‘Empty spaces mean blank faces’, he filled the walls with art, to give the café’s punters plenty of food for the eyes. It truly is a vibrant and happy environment to while away an hour or two. John, helped by a small team of volunteers, curates the walls of the two café rooms, and there is a rolling (usually) monthly programme of art. Artists simply rent wall space to display their work with the gallery taking zero commission on sales. John is also flexible on rent depending on the artist’s circumstances, and you can book a variety of different sized areas, from a small space to exhibit just one piece of work, to hiring out the whole gallery. It’s incredibly popular with local artists and community groups, so make sure book space in advance. I wondered aloud to John how a retired chartered surveyor ends up as a gallery curator. 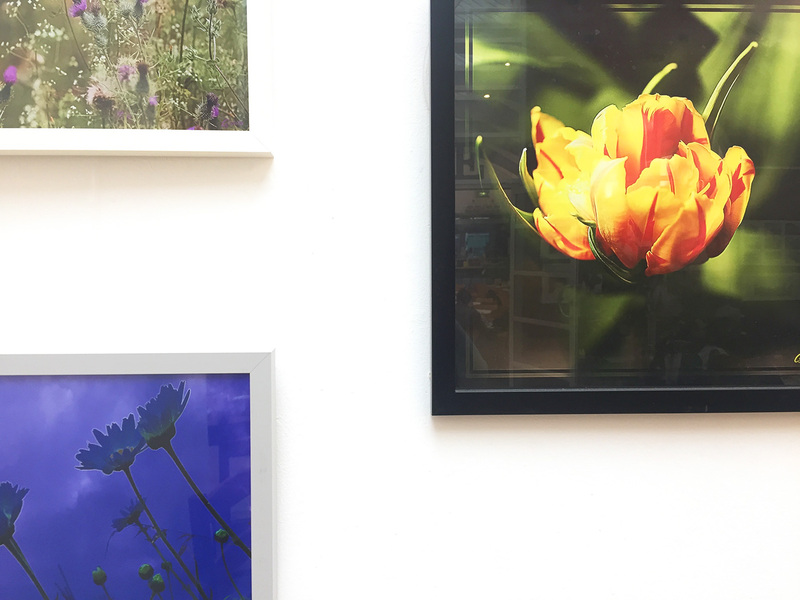 It turns out he has a very big passion for photography, taking on average, a thousand photos a week – sometimes his work can be seen filling unrented spaces on the gallery walls. This is also why the gallery has a nod to photography in its name, and it’s another of his reasons for running Click Clock – to encourage more photography. Finally I ask John the tricky question, whether he has a favourite artist, featured to date. 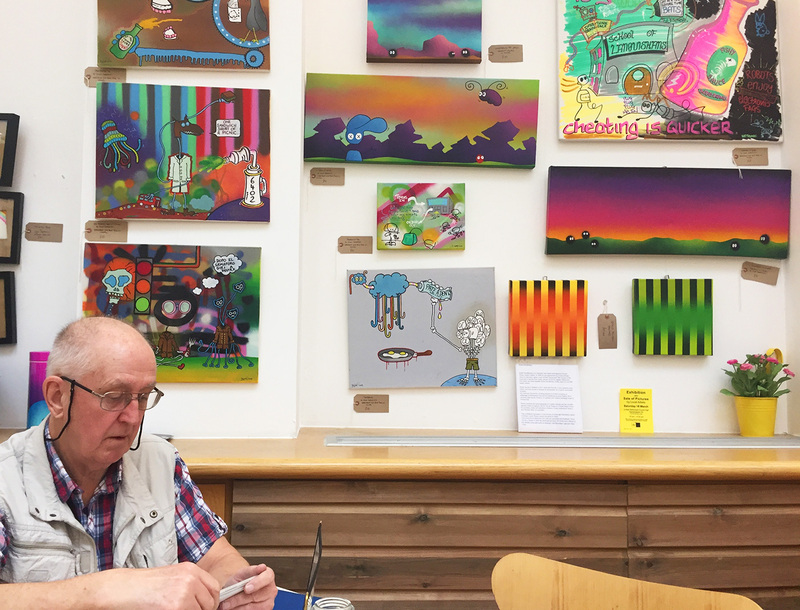 After pondering a while, he mentions two – Bev Jones’ paintings of Croydon – probably the most sales of anyone exhibiting so far, and Dylan Doodleman for his colourful almost graffiti-esque characters in fantastical landscapes (which you can spot on the wall behind John in the picture below, and at the top of this post). Thank you to John for chatting to us. Absolutely can’t wait to visit. Maybe even meet the lovely, brave and talented Nicky Nicholls? I plan a visit in spring 2019.